I have to admit that the 12-credit, continuing education course I signed up for was not supposed to be fun. In fact, I fully expected it to be two full days of classroom work, in a room with no windows, followed by exactly zero recreation time. I knew it would include a working breakfast, working lunch and a couple of bathroom breaks. I’ve done this before in places like Hawaii, Fort Lauderdale, Cape Cod; you name it. And, because of my work schedule, I usually fly in, take (or teach) the course, sleep in some no-nonsense business hotel, then head home the following day. What have I been thinking about for all of these years? 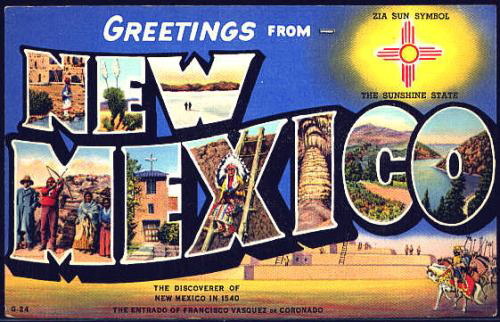 When I arrived in Albuquerque, New Mexico on Sunday and went to the rental car agency desk for my trip to Santa Fe, I should have guessed that something big was going on that week. The service representative told me that she could not rent me the compact car that I had ordered, but, in fact, had to rent me one of those black Secret Service type RV’s that hold eight people, a few rocket launchers and a small quad, but she’d cut me a break on the price. When I asked her about gas mileage, she put her head down and said something like, “Drill, Baby, drill.” The helpful young lady informed me that the Albuquerque International Balloon Festival was taking place throughout the week, and there were virtually no rooms and very few rental cars available anywhere in the area. 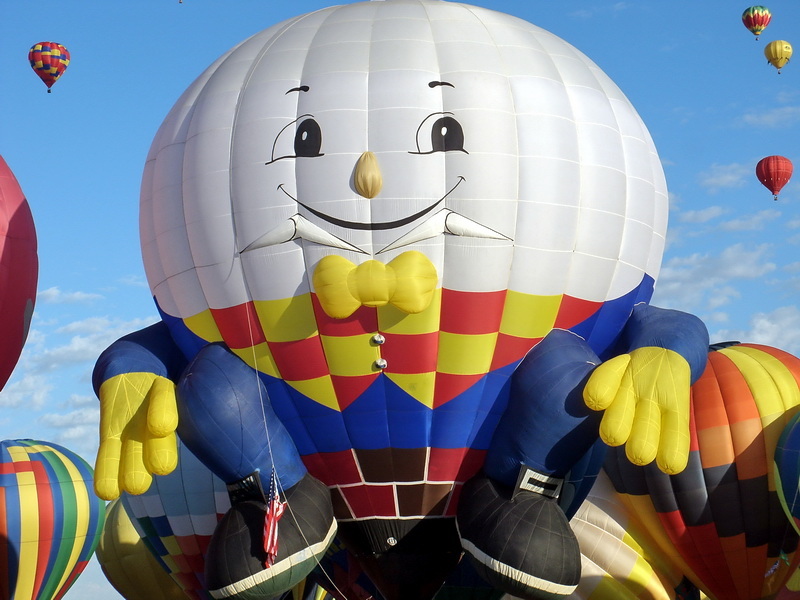 Because I had run a visitors bureau in the 80’s, I had seen pictures of hundreds of hot air balloons floating over New Mexico and knew there was such an event, but didn’t realize it was, you know, this week. My course was being offered by an organization called the American College of Healthcare Executives; the recipient of many thousands of my dollars over the last 25 years. You see, they provide you with a credential that some hospital CEO’s have, and even when you’ve stopped running hospitals, it is important to keep paying them and taking courses in order to maintain the credential until at least six months after your death. One of the unusual things about this credential is that it is spelled FACHE. 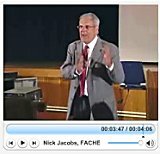 My former assistant once asked me why I signed my name as Nick Jacobs, FACHE, but she pronounced it “fake.” It actually means Fellow in the American College of Healthcare Executives, but, really, her pronunciation was more fun…and a great conversation starter, too. The rain started during my 5:00 AM trip to Santa Fe and continued for two days. So, because the balloons always fly very early in the morning, I never saw even one of them, but on my way to the airport this morning in the shuttle, I overheard a man and his wife discussing “the cow.” He went on and on about how big “the cow” was. It never dawned on me that he was talking about a cow balloon. Finally, when he said, “Those were the biggest set of udders I’d ever seen,” I had to interrupt and question this discussion. At that point he explained to me that the basket was in front of the udders, but I still didn’t get it until he laughed and said, “Heck, man, it was a hot air balloon the size of the Astrodome.” Hence, the title of this post. I’m glad New Mexico, the Land of Enchantment, isn’t wine country. Could you imagine finishing that 22nd sample of some great vintage, walking outside and seeing that colossal, airborne cow coming at you? The course was great, the hotels were clean, and the people were nice, but missing that cow has me really upset. I mean, how many chances do you have in your lifetime to see 600 hot air balloons flying overhead? How many days in a lifetime provide a person with that type of visual opportunity? It’s time to stop and smell some roses. From now on, I’m only going to go to courses that end at noon.